Meat of choice (beef, chicken, turkey or assorted meat) 1 cups of ogbono seeds Stock fish head (medium size) 2 medium size dry fish 1 cup of crayfish (ground) Fluted pumpkin (a bunch) 1 teaspoon of ogiri or ground dawadawa or okpei (local ingredients) (optional) 10 to 15 cl of palm oil About 1 liters of water salt and pepper to taste. Assorted meat is always preferred above all other types of meat in Nigeria. This is just different parts of a cow, from the intestine to the tripes (shaki), kidney, liver, heart and also red meat (beef). But if you want to make this soup with bitter leaves you might want to boil the bitter leaves with water for ten to fifteen minutes, this technique would further reduce the bitter tastes and also soften the leaves (some people also add a little bit of edible potash just to hasten the whole process but I highly advice against this practice because it can change the entire texture of your soup thereby decreasing the nutritional value. Soak the dry fish and stock fish with hot water and wash thoroughly to remove sand and impurities. Parboil your meat the normal way, with all the necessary ingredients (2 cubes of knorr or maggi, salt, onions, half T/S of thyme and other spices or flavors of choice). Add water to the meat after about ten minutes and cook till it is soft enough for consumption and the water is almost dried (just about 1 cup left), You will need to add 5-7 cups of water at this point. Add the washed dry fish and stock fish, about 10 to 150 ml of palm oil, ground crayfish, stir, cover and cook for 10-15 minutes. Add salt and pepper to taste, add a cube of maggi or knorr (optional), add the ground ogbono seeds, stir and cook for another five minutes. 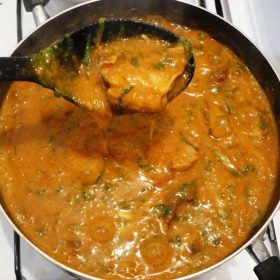 This entry was posted in Nigerian Food and tagged African food, how to cook ogbono soup, Nigerian food, Nigerian Ogbono, Nigerian Ogbono Soup, Ogbono, ogbono soup.